 A chance to train and tour in America’s premiere off-road riding destination. There are three types of adventure riders: those that have been to Moab, Utah, those who are planning to go, and those who want to go but are overwhelmed by the riding options in what is arguably the premier off-road destination in the lower 48 states. Moab offers every type of terrain, from endless easy dirt roads winding through towering red rocks, to single-track trails that would challenge Graham Jarvis. Ride the slick rock competently and you can tackle slopes that you wouldn’t dare attempt elsewhere, thanks to the incredible traction it provides. Take a loop tour on the White Rim Trail and it’s easy to convince yourself you’re the last person left on earth. Head up to the nearby La Sal Mountains for cool breezes, pine trees and After a field trips to drill on skills learnedlate- (or early-) season snow. There just isn’t another area that packs so much riding into one accessible region, and Moab is at the center of it all. It’s an embarrassment of riches, which makes planning a Moab trip more difficult. 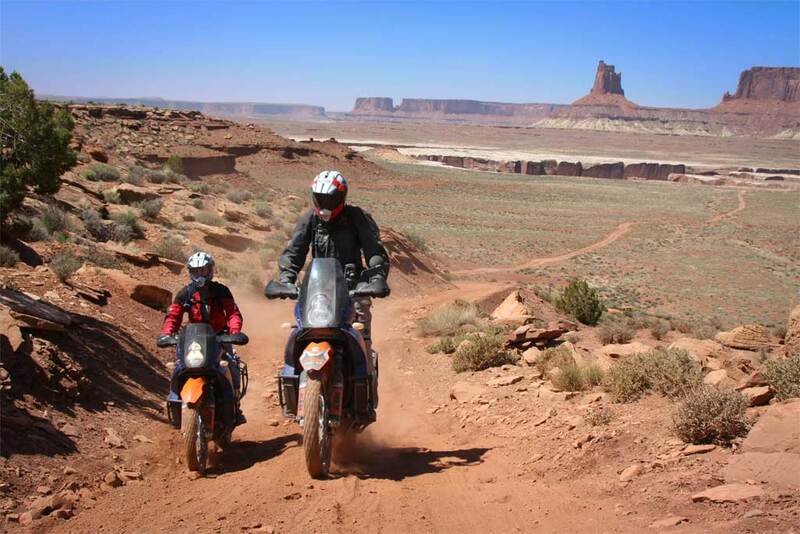 There’s also the fact that riding in Moab takes preparation and an honest assessment of your skills and abilities. Many of the routes, even popular ones, take you far beyond the reach of quick help. If something breaks or someone in your group gets hurt, it’s on you to know what to do and how to do it. And some routes get very difficult, very quickly. It could be a long way back when you realize you are in over your head and backtracking isn’t an option. Then there’s weather. Moab sees all kinds of it, from scorching heat to freezing cold. Flash floods and rock slides can turn an easy route into a survival situation. And you have to know where you are because gas stations are often sparse. If you fall into that third category of adventure rider – you want to get to Moab but the thought of it is a little overwhelming – MotoDiscovery has a ride to consider: The Moab Immersion Training and Tour. 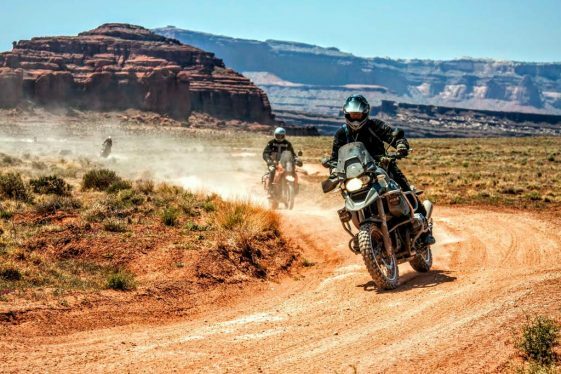 It’s a seven-day, six-night experience that combines rider training with an 850-mile tour of Southern Utah. Participants first acquire the skills and confidence to explore the area, and then the chance to do just that with a guide. The Immersion Tour begins and ends at 3-Step Hideaway, a moto-friendly lodge about 50 miles south of Moab. 3-Step is a popular stop along the Trans America Trail and draws riders from all over the world. It’s also off-the-grid: there’s no cell phone service and the electricity comes from solar panels and generators; all a part of the adventure. The first two days of the Immersion Tour are dedicated to training. Instructors start with the basics including balance, clutch control, body positioning and peg weighting. Even seasoned riders benefit from a review of the fundamentals, and perhaps a gentle correction to bad habits acquired over the miles. Group size is kept to a maximum of 10 so that riders receive individual attention and personalized training. 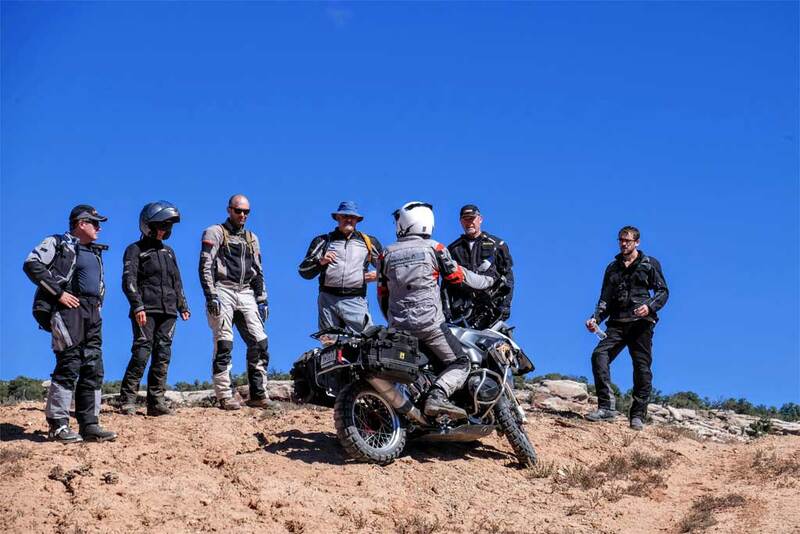 Instruction includes drills on braking, standing on the pegs, riding in sand and how to save yourself when you come up short on a hill climb, a particularly anxiety-inducing scenario that will eventually happen to us all. Instructors also go over the right way to tow a bike, with a bike, and how to fix a flat, both situations most riders will face in their riding career. The idea is to conquer fear of common problems and boost confidence in your abilities so you’ll do more exploring later on your own. Training is provided by MotoDiscovery’s coaching team utilizing the D.A.R.T. curriculum created by BMW Certified Instructor Bill Dragoo. 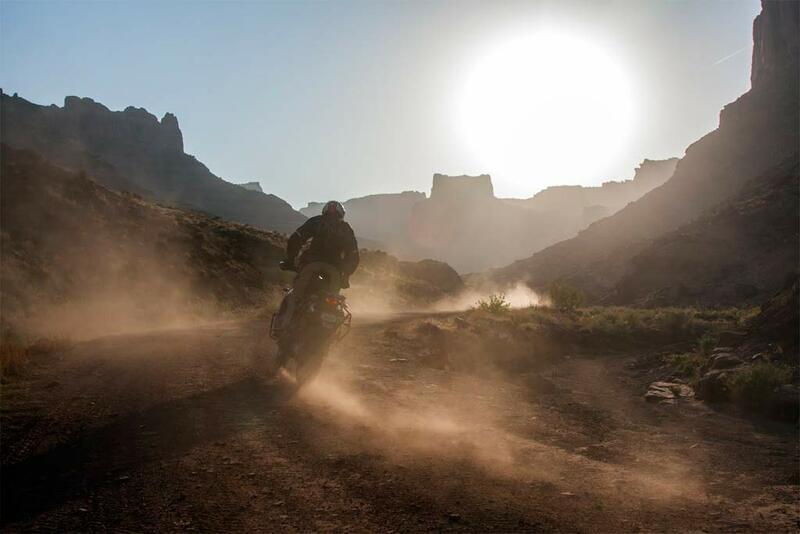 They teach balance, control, judgment and attitude as cornerstones of adventure riding. After drilling on skills learned at 3-Step, the group heads out on day three for a real 850-mile adventure through Southern Utah. Iconic sights including the Needles District of Canyonlands National Park, Monument Valley (which you’ll recognize as the backdrop for any number of westerns), the Glen Canyon National Recreation Area, Capitol Reef National Park, Lake Powell, the Colorado River, the Burr Trail and Arches National Park are typically on the agenda, weather permitting. As mentioned above, rain can quickly change your plans in this typically dry area. Flash floods are a very real concern and dirt roads can become a muddy quagmire. That is where having a guide who knows the area and can reroute quickly comes in handy. Each rider receives individualized instruction in real time as the ride progresses. If you still have skills to polish after the two days of instruction, and you will, the teacher will give you the tips you need, when you need them. That’s an effective way to up your adventure game. 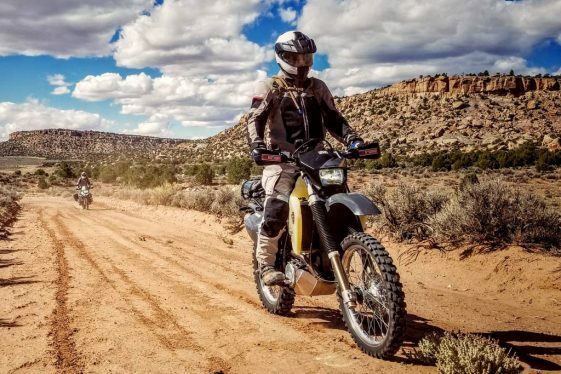 Large adventure bikes are welcome but riders are encouraged to make the trip on a smaller dual sport so they can learn the basics without the intimidating weight and horsepower. Participants can bring their own bike, or rent a CRF250L, DR-Z400 or Africa Twin from MotoDiscovery. 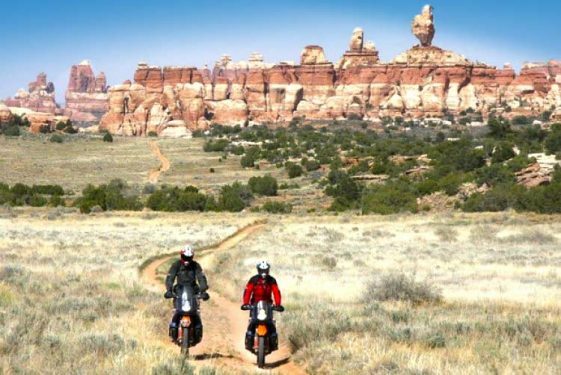 Beyond that, you just need a desire to see the best parts of Southern Utah, and the rest of the world, for that matter: those beyond the pavement. Check out the MotoDiscovery.com website or call (800) 233-0564 for more information and ride dates. Very cool. Sounds like a bucket list experience! I lived in Moab for 10 years. Anytime someone is going on and on about the place- believe them. And they are probably understating it. I did everything on either a mtn bike, a DRZ400, or an F650GS. You can stay in Moab for a week and not see it all. The route MotoDiscovery has outlined in this piece is a great start. You can also go into SW Colorado and hit The Million Dollar Hwy, Telluride, Durango… I still go back, even after having lived there that long.